People often say that we'd never critique a man's clothing the way we do those of female politicians. Sadly for Yukio Hatoyama, the Prime Minister of Japan, sometimes it's equal opportunity! A multi-colored, throwback to the 1980s fashion disaster, [one critic] explained, as he noted the prime minister's red, yellow, green, purple and blue-checked plaid shirt. 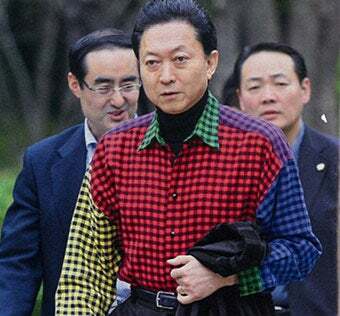 The critic wrote a public condemnation about the shirt in a national magazine and warned the country that the multi-colored get-up represented what the poll numbers already show: Hatoyama is out of touch. "This shirt comes from the '80s or '90s. His ideas and philosophy are old. Japan is facing a crisis and we can't overcome it with a prime minister like this." While the shirt in question, a curious patchwork gingham number in a Lego palette, was undoubtedly hideous (what website Styleite likens to "an item last seen whooping it up on the Arsenio Hall show") the occasion was, after all, a barbecue. But, says critic Konishi, who wrote his excoriating takedown in in Japan's The Yomiuri Shimbun, this was merely indicative of Hatoyama's general sartorial ineptitude. It's the latest crime in a long fashion rap sheet, said Konishi, as he highlighted other multi-colored shirts, mauve coats, and what Konishi calls the biggest faux pas — the hearts and pink blazer outfit. While we might yearn for a time when a POTUS would take such fashion risks, it's hard to imagine when you consider the firestorms that rain down for a pair of dad-jeans or the slightest variation on protocol. We have only red ties and a selection of blue shirts to choose amongst, and still make ten kinds of hay from our politicians' haircuts. Then too, ludicrous toupees have never been any barrier to American political popularity - maybe be just want a pretense of reality, however ludicrous. A heart-printed pink blazer, on the other hand, would spell anarchy. It's probably telling that in Japan, instead, this sort of thing is regarded as the indication of a dowdy stick-in-the-mud.